For the love of God, is that the resurgence of the power ballad we smell? First Staind conquered the country with their serenade, "It's Been a While." Now their buddies in Cold plan to do the same thing with the slow-rocking "Bleed," from 13 Ways To Bleed Onstage. Acoustic is always gonna prevail," says frontman Scooter Ward. "it comes around in cycles." 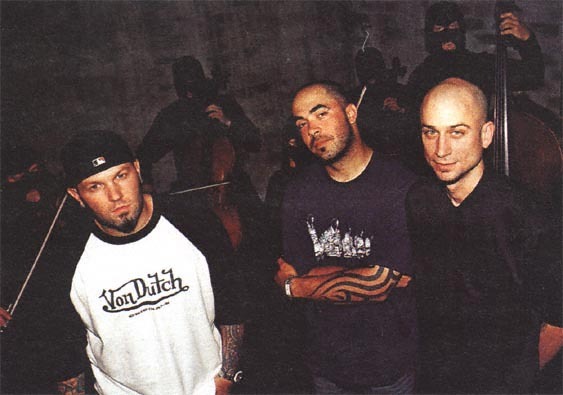 With Fred Durst in the director's seat for the video, background harmonizer Aaron Lewis and a slew of masked violinists (to add dramatic tension, of course) have a hit on their hands. Look for them on the upcoming tour with Weezer ("They're kinda strange," says Ward) and for future Cold-and-Staind collaborations. Well, maybe. Says Ward, "Me and Aaron were just smokin' weed, talking about it, saying, 'Hey, great idea.'" Smoke on.